Examples, solutions, videos, and lessons to help High School students know how to use the relation i2 = –1 and the commutative, associative, and distributive properties to add, subtract, and multiply complex numbers. 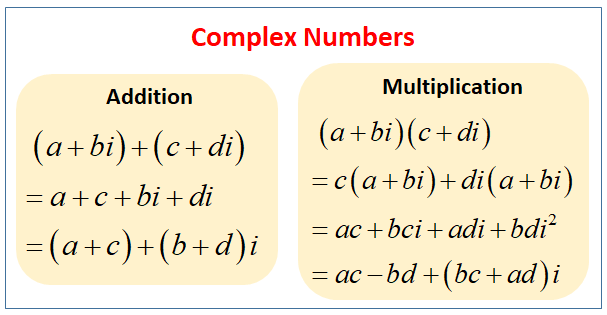 The following table shows how to add and multiply complex numbers. Scroll down the page for more examples and solutions. Complex Numbers - Graphing, Adding, Subtracting. Adding and Subtracting Complex (Imaginary) Numbers. Complex Numbers: Multiplying - Ex 1. Examples of multiplying two complex numbers and simplifying. Complex Numbers: Multiplying - Ex 2. Example of multiplying three complex numbers and simplifying. This video provides examples of how to multiply complex numbers.